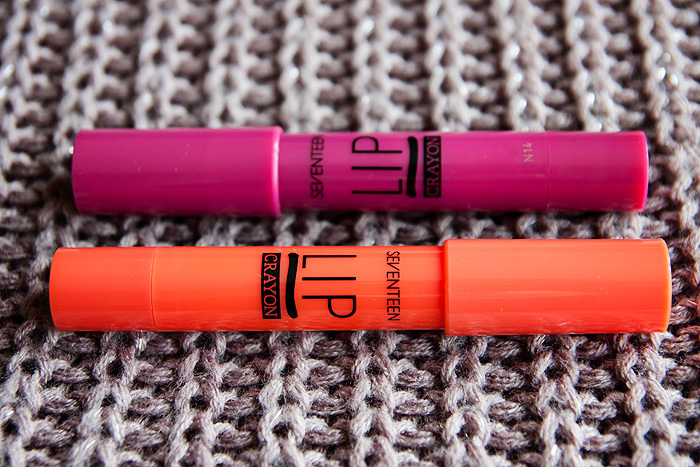 The world is awash with lip crayons! Perhaps we’re all reverting back to our childhoods as an alternative to a rather gloomy reality but what is it with wanting to make our cosmetics look like crayola? Well, whatever it is, I’m loving it. Seventeen, the brand from Boots… one of the most accessible in the UK market, have firmly jumped aboard the lip crayon bandwagon and released their own version. I had no idea what to expect. Would they be sheer and balmy a la the original Clinique formula? Would they be drying like the Revlon Just Bitten Stains? Or perhaps they’ll be uber-glossy like the new No7 Lip Crayons? Well, they actually strike a rather good balance… but with the added bonus of some proper pigment. Hear that? It’s a choir of colour-loving lips singing in celebration. 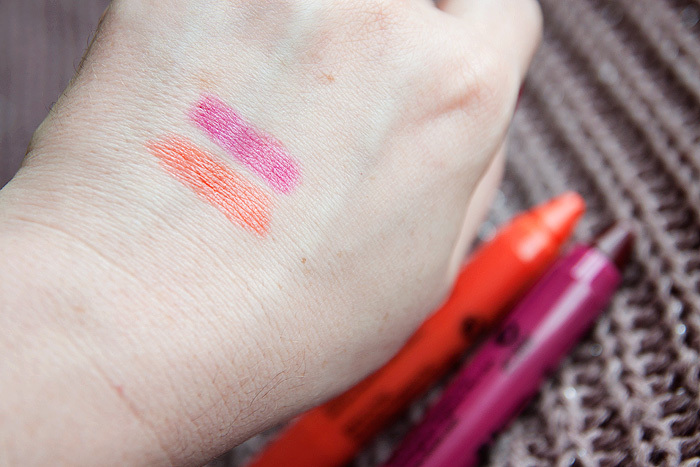 The two shades that I’m swatching today are Bold (orange) and Knockout (plum pink). The packaging is functional and practical with a winder mechanism to wind the crayon up and down. It’s bright… chunky and you’d be hard-pushed to lose it in your handbag. The texture of these lip crayons are both very similar, so although I’ve only tried two from the five shades available, I’m expecting a consistent formula from a brand as well-established as Seventeen are. Talking of the texture, I found it to be quite light considering the amount of pigment it provided. 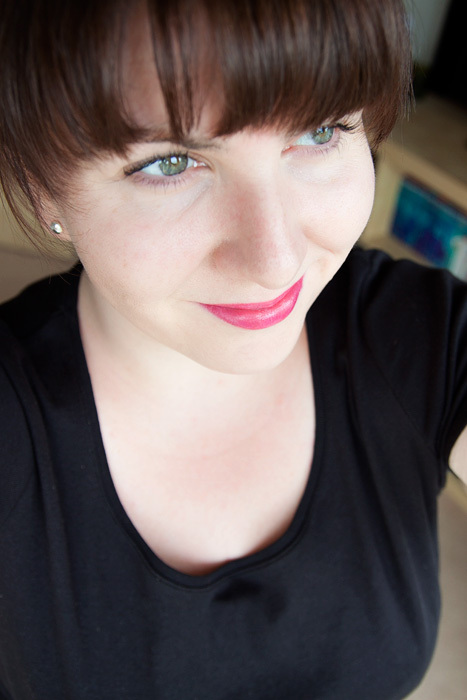 You can see in the lip swatches below that there is no thick layer of product over my lips. The furrows and creases are still fairly well-defined and not filled in with goop! Despite this light layer of product, it punches well above its weight when it comes to coverage. That is some pretty strong colour from a quick slick of crayon. I didn’t notice any horrible smell during application (I’m looking at you Revlon), and the colour glided on with little effort. I’d say that these aren’t quite as moisturising as the original Clinique formula but slightly more moisturising than their newer, intense formula. Considering that we’re looking at nearly the same level of pigmentation, render me suitable impressed. I wouldn’t describe the finish as a high-gloss one, it’s fairly low-key (which I personally prefer) and the colour lasts nicely for about 4-5 hours (less if you’re eating/drinking). It doesn’t leave a stain behind but it does fade pretty evenly. All in all, at only £4.99 a-piece (also currently on buy-one-get-2nd-half-price), the new Seventeen Lip Crayons* are a bleedin’ steal. Have you tried any of the shades yet? These look amazing! Can’t wait to try one out. These look really nice. I have been loving clinque chubby sticks so these look like a great cheaper alternative. Will have to give these a go! I love the Clinique ones and hated the Revlon, what even was that smell? It smelt like a mixture of mint and dirt! urgh. Plus these are even more affordable! Love the looks of Bold! Great color. QVC Beauty - I freakin' love this!! Deal Alert: Yotuel teeth-whitening at BuyaPowa for a huge price drop!